Marietta, GA (September 26, 2011) – Tamara Natalie Madden has a lot to celebrate. A solo exhibition to mark her ten years of art-making opens at Marietta, GA Avisca Fine Art Gallery. That is a remarkable achievement in itself, but more remarkable is her story of tragedy, triumph and an amazing twist of fate that got her to this milestone in her life. In 1997, at 22 years of age, Madden was diagnosed with a rare and incurable genetic kidney disease called IGA Nephropathy. Over the next few years she would watch her body deteriorate while she tried to maintain balance and sanity in the face of a brutal dialysis regimen and with all the toxins that were collecting in her body. At age 13, Madden had moved to the U.S. from her native Jamaica where her childhood was humble but filled with memorable childhood experiences, the love and guidance of family and teachers, and dreams of becoming an artist. Over the next few years she created art sporadically but after her diagnosis, in what may be a silver lining, she turned most of her time, attention and passion to art-making as therapy. In 2000, Madden took a trip to Jamaica to reunite with family and with hopes of finding a half-brother that she had never met. She had no idea that the trip would save her life. On learning of her condition, her brother offered to give her one of his kidneys. The amazing offer was consummated in 2001 with Madden undergoing a successful kidney transplant. That year she participated in her first art exhibition, making good on the determination that she had made long ago to become a professional fine artist. Her art and her career have both grown meteorically since that first exhibition. Today her work can be found in collections such as Vanderbilt University in Tennessee and Alverno College in Wisconsin. She has exhibited in a number of group and solo exhibitions in the United States and Canada. She was a recipient of an individual grant from the Puffin Foundation for her project, “Never Forgotten”, which focused on combating poverty worldwide; and her work has been featured in publications including the New York Times, the Jamaican Gleaner and Upscale magazine. Tamara Madden’s work reveals a fascination with people, usually ordinary, everyday people who, in her portrayal, appear as royalty, nobility, or somehow above the fray of quotidian life, even as they engage in activities that root them in their environment. Perhaps it was the life-saving act of charity and the love and nurturing of family and friends that have shaped her world view in which people are inherently good, divine, ethereal and noble. At the same time, her work also often voices larger social concerns and she is not afraid to use her subjects to turn a spotlight on issues such as poverty, class, status and racism. Her solo exhibition, “Full Circle” is Madden’s loving paean to the people, places and experiences that have informed and inspired her over ten years of art-making. The exhibition opens with a reception on Friday, October 7, 6-9 PM and runs through October 28. The exhibition and reception are free and open to the public. Venue: Avisca Fine Art Gallery, 507 Roswell Street, Marietta, GA 30060. 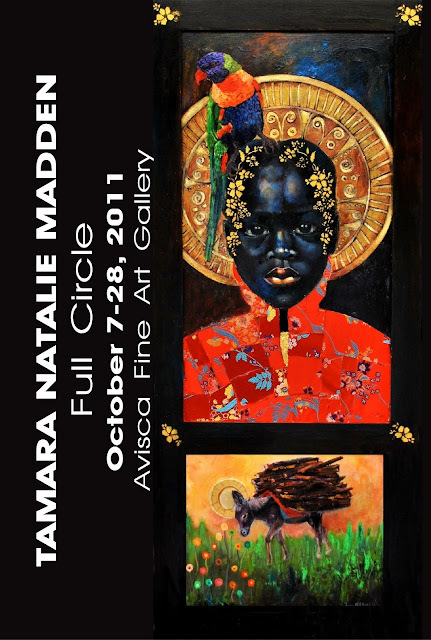 Full Circle - A solo exhibition of new works by artist Tamara Natalie Madden. CLICK HERE FOR DRIVING DIRECTIONS AND MORE INFORMATION! 10 years ago I participated in my very first art exhibition. From the very beginning, my work was about giving a voice to those who are overlooked. Many of my paintings were classified as ‘folk art’, but I wanted the work, and the people who were being painted, to be viewed as royals. The emergence of the new series gave voice to these individuals in a distinctive manner, heightening them through fantastical headdresses and uniquely collaged garb. Full Circle is essentially a fusion of the two styles. It is a my way of delving into my beginnings as an artist to bring light to the things that inspire my art the most—the people, and their experiences. It serves as a way for me to evoke memories of my childhood in Jamaica, while highlighting the very people who inspired me to become the artist that I am. Some paintings focus on strictly conceptual ideas of seeing everyday items as symbols of royalty, while others deal with the mystique of memory. Each painting is my unique perspective about a thing, a moment, or an experience that I have experienced in reality or in theory. The pieces are created using a variety of material. Some more traditional materials include canvases, while others include found objects, again fusing elements of folk art with more traditional elements of fine art.